Big Bar Lake Provincial Park offers volunteer host opportunities. Big Bar Lake Provincial Park comprises approximately 330 hectares of rolling landscape situated on the shore of a large lake, and scattered with small lakes and ponds. The park is couched in typical Cariboo ranching country on the southern edge of the Fraser Plateau. This extensive plateau stretches north beyond Lac La Hache, and was formed from lava flows some five to ten million years ago. The park was established in 1969, and is a very popular destination for family camping vacations. The park features 25 new lakeside campsites in addition to a large day-use area offering beachside picnic areas and a Big Toy for children. The construction project was funded by FRBC through the Campgrounds BC Initiative, and was completed in the summer of 1999. 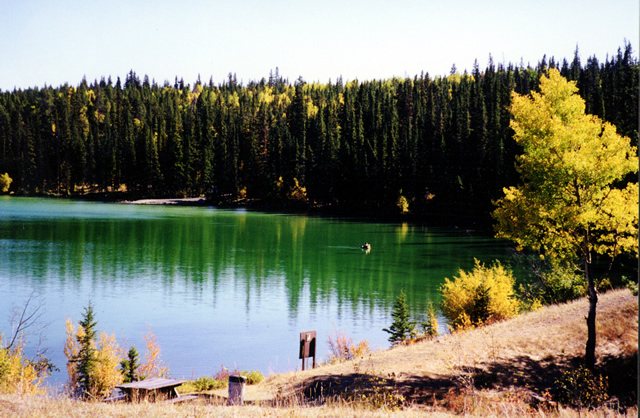 The park’s setting is typical of the southern Cariboo. Set against a mountainous backdrop, the lake is surrounded by lodgepole pine and spruce. Visitors of Big Bar Lake Park often see wildlife on the 4 km hiking trail surrounding the scenic wetlands, and enjoy angling for rainbow trout in the 3-mile long lake. The area is an extremely popular fishing destination, and is also widely used by other recreationists. Area attractions include several guest ranches, the towering Marble Range south of the park, and Gang Ranch country. Visitors can also travel along the Jesmond Loop, by continuing past Big Bar Lake Provincial Park, and eventually connecting with Highway 97 by way of the Jesmond and Kelly Lake Roads. This scenic drive passes by Little Big Bar Lake and the historic townsite of Jesmond, where the OK Corral – one of the oldest ranches in the area – is situated. The loop also accesses the Jesmond fire lookout by way of a narrow four-wheel drive road, from which visitors can enjoy panoramic views of the surrounding landscape, including Marble Range and Edge Hills Provincial Parks. Big Bar Lake Park and the surrounding country provide a beautiful setting for a summer holiday. Big Bar Lake Park is easily accessible, and provides a range of recreational opportunities for outdoor enthusiasts. Some of the major recreational opportunities available in the park include day-use picnicking, lakeside camping, boating, canoeing and kayaking, swimming, wildlife viewing, hiking, and fishing. Abundant rainbow trout typically reward the angler; fishing is active nearly all season, but is typically the best between mid May and late July. Nearby guest ranches offer horseback excursions into the open range that lies north of the lake. Rainbow trout are plentiful in many of the lakes and ponds in the area. Obey fishing regulations; you will need a British Columbia angling licence if you plan to fish. Motor vehicles are restricted to vehicle roads and parking areas. Obey road closures. All closed roads are gated. There is no water skiing permitted on the lake. Please be extremely careful with fire; place aluminum foil under campstove or hibachi to protect tables. Dogs must be leashed at all times, and are not permitted in the day-use and beach areas. ORVs are prohibited in this park. ORVs include ATVs, off-road motorcycles, snowmobiles and side by sides. Note: The above information is for the campground only. Park users can still walk into the park if conditions such as weather permit. Check the "Attention Visitor Notice" above for park alerts. All campsite reservations must be made through Discover Camping. When reservations are not available all campsites function as first-come, first-served. Campsite reservations are accepted and first-come, first-served sites are also available. The park is located approximately 42 km northwest of Clinton. It is easily accessible via Highway 97 to approximately 8 km north of Clinton, and then via gravel road for a distance of about 34 km. For map information, please refer to topographical map number: 1:50,000 92P/15. Approved Purpose Statement and Zoning Plan [PDF] for Big Bar Lake Provincial Park is available online in pdf format. Bicycles must keep to roadways, and bicycle helmets are mandatory in British Columbia. If exploring by mountain bike, the Jesmond Fire lookout provides great views of the Fraser River and the Mountains and rangelands of the Chilcotin. Fishing for rainbow trout is a popular activity, as the lake has had an active stocking program since 1970, and is now stocked on a yearly basis. There have been trout up to 6.5 lb caught in the lake, and many fish are in the two pound range. Nearby Little Big Bar lake and Beaverdam Lake are also popular for fishing. Anyone fishing or angling in British Columbia must have an appropriate licence. There is a 3.5 km self-guided Otter Marsh Interpretive Trail. Please see Otter Marsh Interpretive trail brochure noted above. For your own safety and preservation of the park, obey posted signs and keep to designated trails. Shortcutting trails destroys plant life and soil structure. Swimming is available at the beach located in the day-use area. The swimming area is roped off. There are NO LIFEGUARDS on duty at provincial parks. There is a paved, single-wide boat launch on the lake adjacent to the lakeside campsites. Towing behind boats is not allowed and there is a speed limit of 10 km per hour at Big Bar Lake. Boat launch is open until Canada Thanksgiving weekend. Cold water taps are located throughout the park. Taps are shut off during the off season. There is a day-use/picnicking area with picnic tables, pit toilets, an adventure playground, and a parking area. There are pit toilets located throughout the campground and day-use area. There is a playground at this park located in the day-use area. There are two vehicle accessible campgrounds in this park – Lakeside Campground and the Upper Campground. Campsite reservations are accepted and first-come, first-served sites are also available. The Lakeside Campground consists of 27 sites that overlook the lake. There are 10 high density sites that can accommodate large rigs. There is also 1 pull through site at this campground and parking for extra vehicles is available in the park but not on the sites. The campsites in the Upper Campground consists of 19 sites that are larger and more double sites are available. The sites are nestled amongst the trees and there is parking available for extra vehicles on site. This campground is used for overflow camping. If staff are not around when you arrive at the campground, choose your site and pay later. Staff will be at the campground at least once a day during the camping season. There is no pay phone in the park and the closest store is located in Clinton, approximately 43 km away. This park offers vehicle accessible campsites on a first-come, first-served basis – campsite reservations are not accepted. Upper campground (Sites 28 - 46)- Full Season. A minimum of 4 consecutive weeks must be booked. Please contact the Park Operator for information and to book one of these sites. Information on other parks participating in this program, or a link to the Long Stay Policy document, is available on the Frontcountry Camping Policies and Fees webpage.